Dolby Laboratories: quietly making it sound better | What Hi-Fi? “The story of Dolby Laboratories is the story of advancement in audio technology”. This level of understatement and self-effacement is far from common in the electronics industry, but somehow it suits Dolby just fine. After all, not many companies achieve ubiquity in spite of its consumers not having a firm idea of what is they do. But there’s nothing at all vague about the company’s achievements. If it’s groundbreaking technological strides you require making, a firm-jawed commitment to innovation or an entirely laudable dedication to the science of sound you require, Dolby Laboratories has what you need – and in spades. Just don’t expect it to make a song-and-dance about it. 1998 – First video game with Dolby Digital 5.1 audio launched. The general air of restraint continues as far as the company’s offices in London’s Soho Square. I guess the address itself is eloquent enough – there’s no need to gild this particular real-estate lily. Understated (that word again) to the point of anonymity, the building is home to, among other things, the Ray Dolby Theatre. Designed as a reference room for both audio and video, the 67-seat theatre is a technological tour de force. 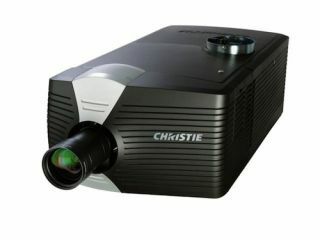 Pictures are supplied by a Christie CP4230 4K DLP Dolby 3D digital HFR projector, fed by Dolby’s Digital Cinema Server DSS220 and Integrated Media Block. Alternatively, there’s a high-end 35mm projector available too. Sources catered for include Blu-ray, HDCAM and 2K/4K file-based content. That’s impressive enough but, unsurprisingly, it’s with audio that Dolby has really gone to town here: the Ray Dolby Theatre is equipped with a total of 36 loudspeakers. The screen channels consist of 5 JBL 5732 3-way speakers (tri-amped) and three JBL 4642A dual-cabinet subwoofers with 18in drivers. Surround duties (which are extensive) are handled by 26 JBL AM7212/64 two-way speakers, while the lowest of the low frequencies fall to a pair of JBL 4641s. These aren’t subwoofers; these are Surround Bass Management units. Amplification is provided by 27 (!) Crown CTs3000 amps, each rated to 1500w and each with independent high/low frequency selection to suit their specific channel. Each is embedded with a PIP-BLU module for audio over Ethernet. Processing, meanwhile, is variously dealt with by Dolby Lake, Dolby System and Dolby Atmos processors. Ah yes, Dolby Atmos. Dolby’s latest innovation is nothing less than a new platform for cinema sound, one that offers filmmakers more creative leeway than ever before – the addition of overhead speakers to complement the surround arrays means sound can be matched to on-screen images more precisely than ever before. Dialogue follows characters, effects follow camera pans, and a convincing suggestion of height joins the already-established width and depth dimensions of the sound-field. On a technical level, Atmos is as big a step forward as it is in terms of the end result. A soundtrack can now be constructed in layers: a base layer, consisting largely of static ambient sounds, is mixed using the traditional channel-based method. Layered on top of these sounds are more dynamic audio elements that can be positioned and moved precisely to correspond with on-screen images. For the first time the mixing of a movie soundtrack is truly object-oriented, and the layered approach to sound design allows for support of up to 128 simultaneous, lossless elements in a mix. Certainly the benefits of Dolby Atmos were as plain as day to me when I was fortunate enough to visit the Ray Dolby Theatre. It goes without saying that soundtracks are delivered with the kind of forceful, casual authority that makes short work of the most testing dynamic variances; the width and depth of the sound-field extends well beyond the physical confines of the room. In terms of effects placement, too, the system’s precision and focus is absolutely unarguable. And the Atmos processing brings height strongly into play, allowing effects to not only travel horizontally across the left/right axis at a variety of heights, but vertically on an up/down axis – and, of course, across the horizontal and vertical at the same time, and with apparently endless variance and subtlety. The Empire Leicester Square in London is Atmos-equipped, but you can expect a host of cinemas to follow suit. Already films like The Hobbit: An Unexpected Journey, Rise of the Guardians, Pacific Rim and Gravity have been mixed in Dolby Atmos, and the company expects a further 15 titles to be released in Dolby Atmos before the year is out. Be in no doubt, this audio format is as big a step on in the cinematic experience as surround-sound was all those years ago. "You don't do heavy metal in Dobly", true. But The Hobbit: An Unexpected Journey in Dolby Atmos is an audio exerience to rank with the best.